This button allows you to join the current scene with the next one, in order to obtain only one scene, composed of several clips. This button cuts a scene after the current clip. The resting clips form a new scene. This button allows you to duplicate a scene and all its contents (clips and their contains). This function allows you to merge the current clip with the next one into the same clip. 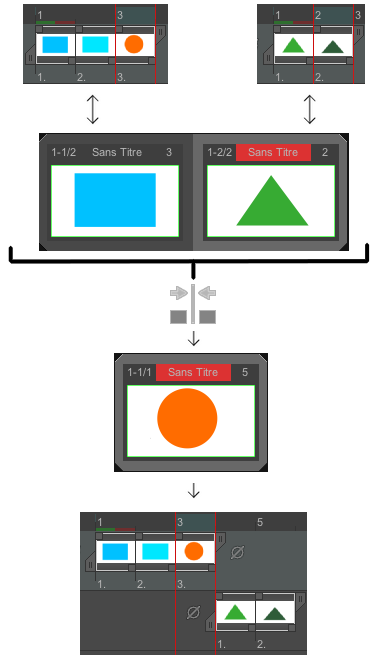 This function allows you to split a clip into two clips (reunited into the same scene), after the current picture (clip has to contain several images). Contrary to other functions, this last function is visible only if your storyboard is using “timeline” view. 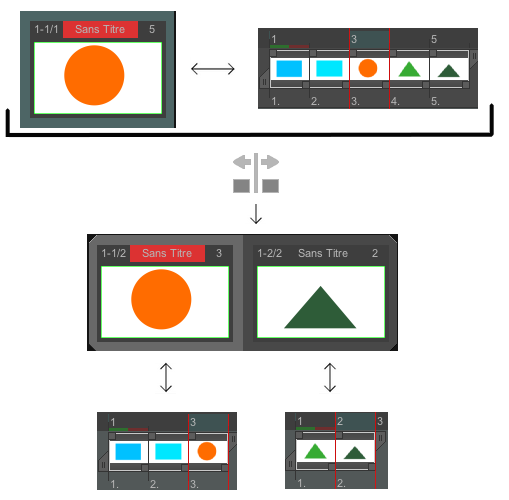 View modes are explained further in this lesson. In order to manage more easily your storyboard, TVPaint Animation includes a numbering system of your scenes and clips, in the left corner, at the top of each clips (see opposite). In the present case, the number 1 indicates the scene number : it means this scene is the first one of the storyboard. The numbers 2/3 indicates that we are on the the second clip of the current scene, and that this scene is composed of 3 clips.